How did you get into fishing? Is it a long term interest you’ve had? I’ve been fishing since I was a small kid, around 6 or 7 years old. I first went fishing on a river for the first time at a spot on the River Lambourne in Newbury, outside the old persons’ home where my grandfather lived. Do you prefer fishing on the river? Yes, definitely, catching species like Chub and Grayling. 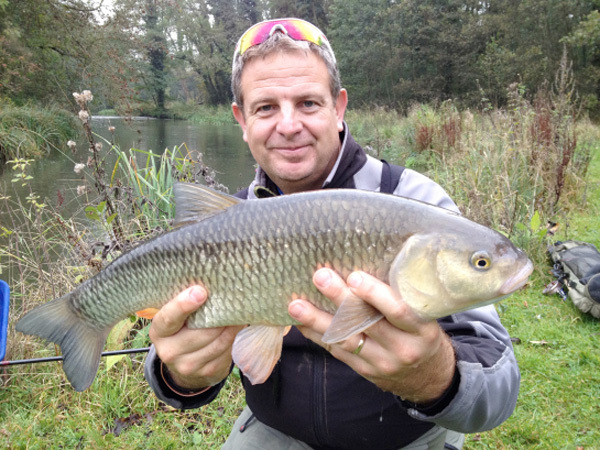 I really enjoy chalk streams with a centre pin reel, trotting a big Avon float or alloy stick. For me, there isn’t a type of fishing I don’t enjoy and I try pretty much everything. I suppose I haven’t done too much carp fishing, getting bivvied up isn’t something I’ve really been interested in going for. Do you do much match fishing? Periodically, but I haven’t done much lately. I got heavily into it for a little while but to be honest the time I get to go fishing is quite limited at the moment – certainly for pleasure. The irony is, although I make a lot of films about fishing I don’t get to go a lot for my own purposes – for a day out. If I do get chance it will be for a short session, usually I will nip up to the Itchen which isn’t too far away or nip to the coast and do some lure fishing. To actually commit to fish a match, you know what match fishing is like, it’s a big commitment – preparation and tying rigs the day before, up at the crack of dawn driving to the venue, fish all day and by the time you are home it’s 8 o’clock at night. I have a family so that doesn’t really fit in at the moment. I’ve got all of the kit, so when I get the chance I’ll go! How did the job with Tight Lines come about? I’ve been a journalist for a very long time. I started at 17 working in newspapers in Berkshire. In 1988 I moved to Portsmouth to work as a sports journalist, then I think it was ‘99 or 2000 I moved into television working as a news reporter and occasional news editor for Sky. I’ve always wanted to make films on fishing, so when I knew more about Tight Lines I sent an email to the producer and Keith Arthur suggested they give me a go. I haven’t looked back since and I’ve been working on the programme for 7-8 years I think it is. Sounds like it suits you well, is it your dream job? It is yes, you meet so many great people and get the chance to go to some fantastic locations. One of the nice things about covering a niche sport, such as angling, when you turn up with a television camera people are always pleased to see you. I have covered premiership football, first class cricket, top level rugby – in most of the top level sports you get a kind of “here they are” type reaction and it’s a situation you have to manage. When you cover a sport that gets less attention people are always pleased to see you and the result of that is a really great atmosphere to work in. I really love making films, creating images, putting sequences together and choosing music to go with the films. It’s brilliant fun! What kind of timeframes do you work on for the features? How far in advance do you create the films? There are two ways we approach this. There are certain things on the calendar which we know are coming so we will plan a feature to go with it. Examples of these would be when the mayfly hatch, when the fishing season starts or finishes. There are lots of cyclical events in the fishing season. We are also capable of moving quickly for certain items. Thats the way that TV works, we’ve got the ability to make a film about something and turn it around in a few days. The film we did last week, Peter Cockwill and Keith went fly fishing on the Tuesday and it was in the programme on Friday. What I’m used to doing as a television journalist is getting stories on the same day, filming items in the morning and then they are on the programme in the evening. What has been the favourite feature that you’ve reported on? Hmmm.. crikey! I have loved doing the World Championships, I think I have done 7 of those now. I did a fantastic trip to Alderney for 4 days filming where we had to make 4 films in 4 days – that was great fun, my favourite one of those was the day with Mark Harding where we went lure fishing in a little boat from around 4.30am until 6.30pm! It was a long day, but it was a great days filming, terrific fun. I’ve really enjoyed some of the Bass fishing with a guy called Austin Goldsmith down in Cornwall. 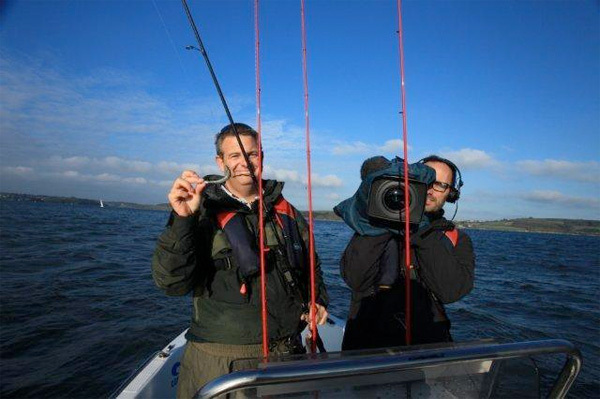 I’ve made some really great match fishing films with people like Des Shipp and Andy Neal. They are great people to work with and we always have good fun together. I’ve done some terrific fly fishing for Pike films with David Wolsoncroft-Dodds, that was one of the prettiest venues we’ve filmed at, Bowood House in Wiltshire, it really was lovely. Fly fishing for pike sounds like an exciting day out? It was, yes! We filmed this twice, the first time we blanked and that was during high summer when it was really bright and hot, at 7am the water was 22 degrees, by which the time the Pike don’t feed. We knew we were up against it so we were fishing with poppers on the top, with what are called crease flies. We didn’t get a single take, nothing! It was such a beautiful location so we agreed to go back in the winter and that was a fabulous day, I think we had 9 fish between us, I dropped a really big fish too, using fly tackle it is fairly difficult to set the hook in the Pikes mouth, as the rods are so soft. Playing a pike on a fly rod is phenomenal fun, any fish on a fly rod is really! I’ve been reading your blog a lot over the past few weeks.. what are your long term plans with that? I just thought that as I have a lot of films I started to go back through the archives watching them and thought they were enjoyable. Most of the fishing on TV these days, outside of Tight Lines, is content that is repeated which was filmed a long time ago. I just thought I would if I can put some of the film I have done or that other have done for the programme together for people to enjoy then that would be a good thing to do. I’ve always enjoyed writing about fishing but I don’t really get chance to create written pieces. I had a small spell working on the Southern Angling publication a while ago, I was guest editor for one edition which was great fun too. To get the chance to write was a prime reason for starting the blog. When I’m not working for Tight Lines I teach at Southampton Solent University, we teach the students how to do blogs, so after being exposed to that I thought why not give it a go? The amount of traffic the site has received is extraordinary, with thousands of visits from around the world in just a few weeks. I’ve had hits from Australia, Turkey, the States, lots of places that are really far away, it’s quite bizarre really. I’m trying to keep drip feeding films through that are relevant to the time of year. I’ve seen a few winter videos lately! The winter video at Rushmore and the snow storm at Viaduct looked like cold days out on the bank? They were great fun to do. The day at Viaduct was Bodge’s fault, I wouldn’t have gone if it wasn’t for him! What stories can we look out for on the blog over the next few weeks? I think I’m going to start putting up some of the features I’ve done at the World Championships, they are really interesting. It’s an area of fishing that I don’t think people give enough respect to. The dedication that all of the international teams have to put in just to be there is extraordinary. The whole environment is completely absorbing. Ive seem top level sport in lots of disciplines: football, cricket, rugby.. the amount of work and dedication the international teams put in is no different to any other professional sport, the only difference is that the fishermen pay to be there. Before Des Shipp recently gave up his job, which was only 12-16 months ago, he would often have to take sometimes unpaid leave to drive across Europe to fish for his country. I don’t think a lot of people realise that. A lot of people look at people like Alan Scotthorne and think he must be minted. He isn’t, he’s just a completely dedicated angler. Look at Sean Ashby the current reigning world champion, the amount of stick he’s had on the internet from people who don’t know what he’s been through to get where he is. At the last world championship he got the 2 good draws , and that combined with what he is best at, catching small silverfish to international rules and he slaughtered it – it was fantastic to watch! To be able to make films about these guys is really interesting and I feel privileged. It’s always quite surprising. The World Champs are such big events, yet outside of the angling press, eg the Angling Times or Mail there is no coverage. The only outlet is you on Tight Lines. I always get good feedback about the features on the big championships. People like the behind the scenes elements and the interviews. It’s something different and people enjoy them a lot. This years championships will be held in Poland and I can’t wait, the Polish team are phenomenal! This entry was posted in Interviews by info@looksfishy.co.uk. Bookmark the permalink.